Durantino, Guido probably (workshop) [Italian ceramist, active.1520-1576]. Raimondi, Marcantonio after (engraver) [Engraver, c.1480-post 1526/ante 1535]. 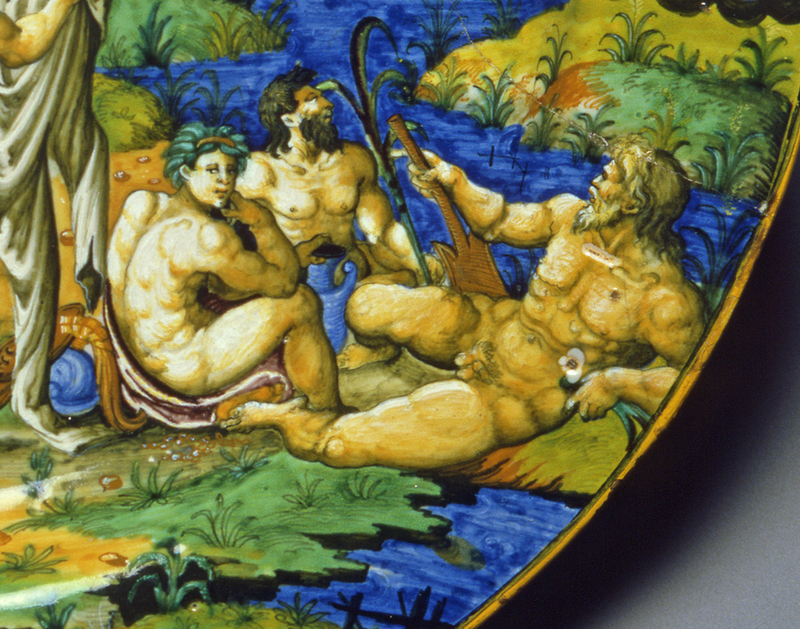 Maiolica dish, painted in polychrome with The Judgement of Paris. Production Place: Urbino. Earthenware, tin-glazed overall; the reverse pale beige. Painted in blue, green, turquoise, yellow, orange, stone, brown, manganese-purple, black, grey, and white. Dimensions: height: (whole): 5 cm, diameter: (whole): 45.4 cm . circa 1545-1550.